A system that is robust and particularly suitable for classroom exercises, performing experiments and general training. 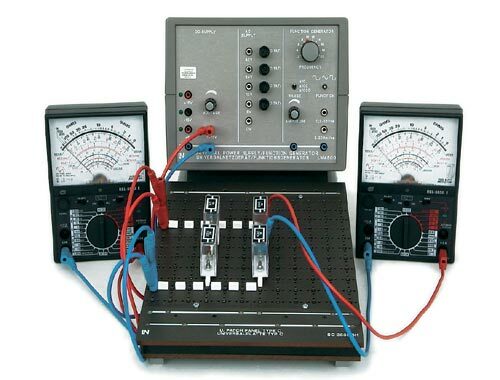 The plug-in system allows the construction of experiments that are in practical terms identical to the circuit diagram.The electronic components are already arranged in subject-oriented kits complete with documentation. Experiments are accompanied by their own literature and the low voltages used mean that the system is safe to use even for complete novices. The system not only enhances knowledge, it also hones the hands-on skills that form the basis for more advanced training. Various applications are possible with the Lucas-Nülle plug-in system. The universal patch-panel can be hung in an H-profile exercise frame or can simply be placed on a laboratory table. A more compact solution are our case systems, that are characterised by the very short preparation times. Our power supply units and measurement units are tailor-made to suit the application in hand. Surprise yourself by taking a look at our excellent equipment suggestions!